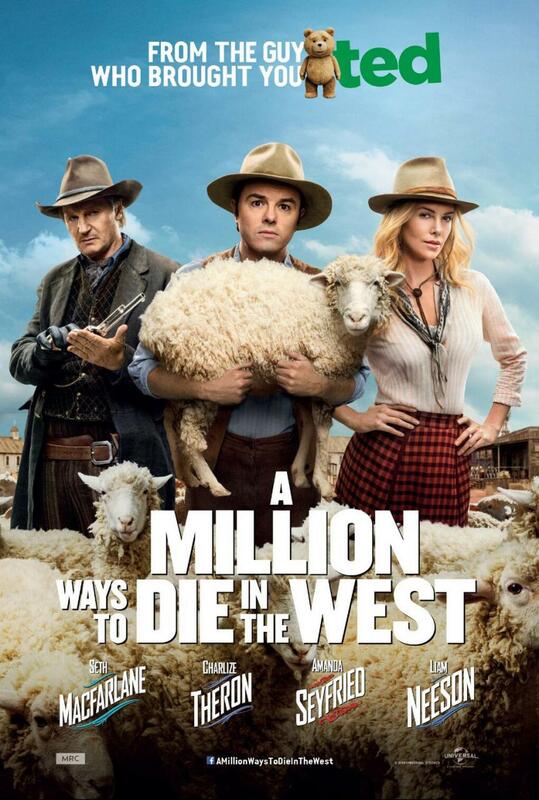 Universal Pictures has released a new poster for Seth MacFarlane's new comedy western, A Million Ways to Die in the West. MacFarlane plays a cowardly sheep farmer named Albert. "After Albert backs out of a gunfight, his fickle girlfriend leaves him for another man. When a mysterious and beautiful woman rides into town, she helps him find his courage and they begin to fall in love. But when her husband, a notorious outlaw, arrives seeking revenge, the farmer must put his newfound courage to the test." The movie comes out on May 30th and also stars Amanda Seyfried, Neil Patrick Harris, Charlize Theron, Liam Neeson, Giovanni Ribisi, and Sarah Silverman.